O God, who assigned Saint Matthias a place in the college of Apostles, grant us, through his intercession, that, rejoicing at how your love has been allotted to us, we may merit to be numbered among the elect. Through our Lord Jesus Christ, your Son, who lives and reigns with you in the unity of the Holy Spirit, one God, for ever and ever. According to the 1962 Missal of St. John XXIII the Extraordinary Form of the Roman Rite, St. Matthias' feast was celebrated on February 24 or 25. Today is the commemoration of St. Boniface who after a stormy youth, was converted to the Catholic faith, suffered numerous tortures, and was beheaded in 307. Mathias was one of the first to follow our Savior; and he was an eye-witness of all His divine actions up to the very day of the Ascension. He was one of the seventy-two disciples; but our Lord had not conferred upon him the dignity of an apostle. And yet, he was to have this great glory, for it was of him that David spoke, when he prophesied that another should take the bishopric left vacant by the apostasy of Judas the traitor. In the interval between Jesus' Ascension and the descent of the Holy Ghost, the apostolic college had to complete the mystic number fixed by our Lord Himself, so that there might be the twelve on that solemn day, when the Church, filled with the Holy Ghost, was to manifest herself to the Synagogue. The lot fell on Mathias; he shared with his brother-apostles the persecution in Jerusalem, and, when the time came for the ambassadors of Christ to separate, he set out for the countries allotted to him. Tradition tells us that these were Cappadocia and the provinces bordering on the Caspian Sea. The virtues, labor, and sufferings of St. Mathias have not been handed down to us: this explains the lack of proper lessons on his life, such as we have for the feasts of the rest of the apostles. Clement of Alexandria records in his writings several sayings of our holy apostle. One of these is so very appropriate to the spirit of the present season, that we consider it a duty to quote it. 'It behooves us to combat the flesh, and make use of it, without pampering it by unlawful gratifications. As to the soul, we must develop her power by faith and knowledge.' How profound is the teaching contained in these few words! Sin has deranged the order which the Creator had established. It gave the outward man such a tendency to grovel in things which degrade him, that the only means left us for the restoration of the image and likeness of God unto which we were created, is the forcible subjection of the body to the spirit. But the spirit itself, that is, the soul, was also impaired by original sin, and her inclinations were made prone to evil; what is to be her protection? Faith and knowledge. Faith humbles her, and then exalts and rewards her; and the reward is knowledge. — Excerpted from The Liturgical Year, Abbot Gueranger O.S.B. Symbols: Halbert; lance; carpenter's square; sword held by its point; axe; saw; scroll; scimitar and book; stone; battle axe; two stones; long cross; hatchet. 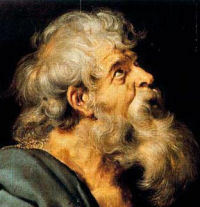 Celebrate the triumph of St. Matthias by reading the hymn taken from the Menaea of the Greeks. According to certain very unreliable "Acts", Boniface was a Roman citizen who for a time lived in sinful union with a noble woman named Aglae. Upon his conversion he determined to do penance by seeking the remains of martyrs and giving them honorable burial. At Tarsus he found many confessors about to be martyred for professing the faith; he kissed their chains and encouraged them to bear their sufferings courageously, assuring them that everlasting rest would follow a brief struggle. Finally he himself was taken captive, his body mangled with iron hooks, and boiling lead poured into his mouth. In spite of excruciating pain only one cry came from the lips of Boniface: "I thank You, Christ Jesus, Son of God!" When Aglae, who in the meantime had likewise repented and was devoting herself to acts of virtue, was informed by an angel of the martyr's death, she hastened to inter the sacred remains in a church erected to his honor. His martyrdom took place on May 14 in Tarsus, a city in Cilicia, during the reign of the Emperors Diocletian and Maximian. As a penance for his sins, Boniface sought out the remains of martyrs and provided honorable burial. Such an act of penance today would appear strange, even though motivated by love and contrition. And yet it was an act wholly pleasing to the Lord. This penitent became a martyr himself, and suffered the most excruciating torments during which he continuously repeated: "I thank You, Christ Jesus, Son of God!"